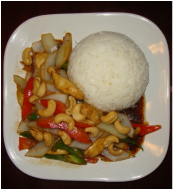 Your choice of meat stir fried with ginger, onions, baby corn, shitake mushrooms, scallions, red and green peppers. 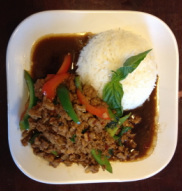 Your choice of ground meat stir fried with basil, red and green peppers. 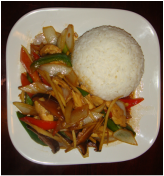 Your choice of meat stir fried with onions and red and green peppers. 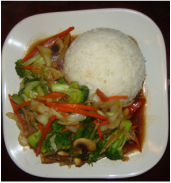 Your choice of meat stir fried with onions, carrots, bok choy, broccoli, cabbage, bean sprouts, mushrooms, baby corn and zucchinis. 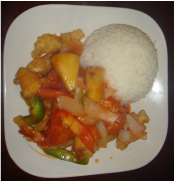 Your choice of fried meat with pineapple, red and green peppers covered in sweet and sour sauce. 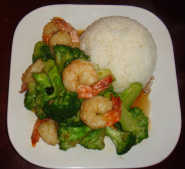 Your choice of meat stir fired in a garlic sauce with onions, broccoli and carrots.